We do love a change of season. It means gorgeous new baby fashion, and a chance to freshen up the nursery. The Babyology editorial team has had a sneak peek at the new David Jones’ catalogue, and we’re bursting to let you know what’s heading in store this autumn and winter. Come and see what we’ve chosen as our top picks from David Jones’ new season. When we’re asked to curate our favourite finds from a baby product haven like David Jones, we take the job rather seriously. And debate has raged at Babyology HQ, about just which brilliant finds will make the cut. Rest assured, we’ll happily take one of everything in the new season catalogue – but back to the task at hand! We have managed to whittle it down to these beautiful products – after much deliberation. When it comes to the fashion stakes, David Jones has assembled a heavenly hub of stunning brands – and the cooler weather has seen a resurgence in toasty warm knits and beautiful designs. Three children’s fashion labels have made our top 10, including Bebe by Minihaha. If you’re looking for special occasion clothing – think christenings and weddings – a highlight of the new collection are the crisp, patterned shirts and frilly frocks. There’s precious little sweeter than a freshly bathed baby in beautiful pyjamas. David Jones’ own brand, Baby, has a delicious new range of cooler weather pyjamas. And the always fashion-forward Country Road is opening its new season range with soft, pastel jumpsuits (above) and adorable knits. 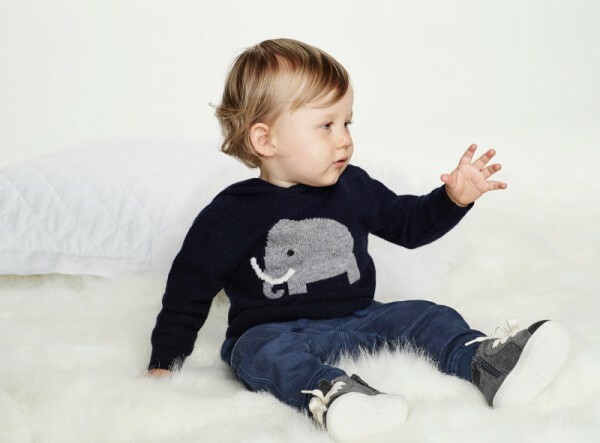 The list of brands goes on, like a Babyology’s what’s-what of the very best baby fashions – Purebaby, Baby by Industrie, Armani Junior, Bonds and Seed among them. We’ve been swooning over the gorgeous new kicks for those just finding their feet – we’re particularly enamoured by what Ralph Lauren, Bobux and Skeanie have on offer. Soft, supple leather, comfy canvas and embellishments to die for. Finally, we just had to include some of the utterly squeezable soft toys on offer – which will be perfect for snuggling on the cold nights ahead! Our pick of the lot has to be David Jones’ own Play collection – with beautiful detailing and trademark stitching. 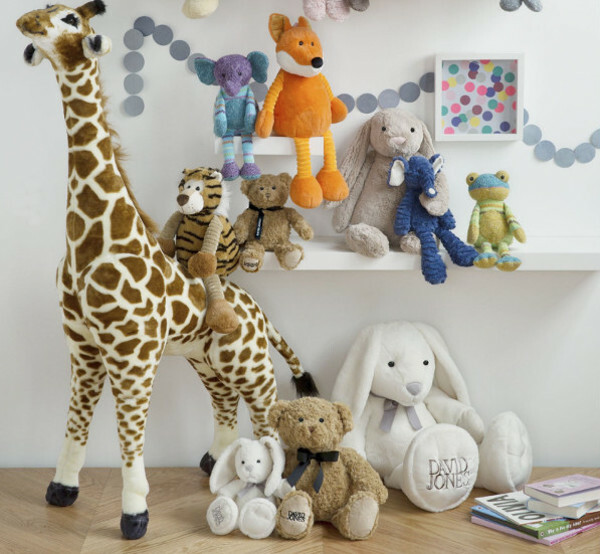 And Jellycats has once again excelled with a luxe selection of perfectly crafted, cuddly creatures. We’re in love! Obviously, we can’t include everything we love in the space of this post! But if you want to see the rest from the comfort of your sofa (and believe us, you do) check out their catalogue (which includes a really handy baby clothing checklist). You may want to pay particular attention to the range of special offers with up to 25 per cent off leading brands of designer baby and maternity clothing, nursery furniture, prams, carriers and toys. You can shop at David Jones online or in store.